But recently I’ve been investigating the book Aristote au mont Saint-Michel. Because I’m interested in a perceived clash of civilizations. 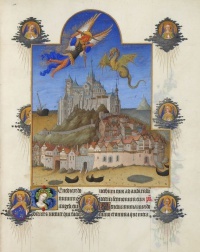 Illustration: Folio 195 of the Très Riches Heures du Duc de Berry. This entry was posted in Uncategorized on July 27, 2017 by jahsonic.